We are addicted to shortcuts. Regardless of the structure and rules of the contest at hand, some among us will stretch the boundaries seeking an edge over our opponent. Perhaps this is just human nature, or maybe it’s more prevalent in America where we cherish our opportunity to have a strong role in our personal success. This insatiable desire to do more, to do better, to just do, is the psychological scaffolding thats supports hedge fund melt-downs, cyclists’ doping, and websites that sell college term papers. Throughout history, in a quest to accrue more visibility in a competitive marketplace certain marketing professionals have sought an edge by exploiting loopholes. We don’t just want our fair share, we want more than our fair share, which creates a marketing and business culture that tolerates – rewards, even – the gamification of attention. Whether you view these activities as creative or nefarious is based on your own sense of situational ethics, but either way I find that when you remove them from the context of the battle in which they were waged, then often look silly in arrears. My friend Tom Webster, the brilliant market researcher and blogger and I were talking about this phenomenon recently when he pointed out how the platform changes, but the darting through loopholes remains. A quick glance of my local phone book (yes, I still have one but I had to scour the house to find it) shows the gamification of attention in action. Evidently, the “all CAPS” bail bonds guys (shown above) get listed before the one CAP, then lower-case a’s bail bonds guys. This is the type of “at the margins of decency” tactic that probably has the all CAPS guys high-fiving in the conference room (or whatever bail bonds companies use as a company meeting space – courthouse steps? ), but when you pull it out of its competitive context, seems pretty stupid. On the front page of today’s local newspaper (yes, I still get one because I am a cranky, middle-aged man that has read a newspaper every day for the past 30 years) I found this sticker plastered across the masthead. This is the dead trees version of a pop-up ad, and like the AAAAAAAa routine, is used to divert attention away from whatever the victim was trying to do, funneling it instead toward yourself. I’m certain the successful purchase and placement of this sticker spurred high-fives in the conference room of whatever this sticker is actually promoting, which is manifestly unclear. Are You Aggressive or Out of Bounds? Seemingly, the technology of marketing has changed more in the last three years than in the prior thirty, the byproduct of which is more opportunities to try to best your competitors through any possible means. Remove your social media efforts from their present competitive context and ask yourself whether purchasing Facebook fans (either directly, or indirectly through advertising) is creating business value or is a new version of AAAAAAAa bail bonds in the phone book? Is following people on Twitter just so some of them will follow back a sound tactic, or an attempt to gamify attention? Is artificially inflating your YouTube views a smart way to outfox your competitors, or is it cheating? Is finding a potential customer talking to one of your competitors on Twitter, and then jumping into that conversation to try to win them over an aggressive marketing outreach program, or something less noble? What you’re willing to do and how much of this you’re willing to embrace as a marketer is based on a lot of factors both personal and professional. But one thing I know for sure is that every single one of these tactics, from the phone book, to the newspaper, to SEO, to social media gamification, may be a positive for you and your brand but are ALWAYS a negative for customers and consumers because it creates artificial awareness that has neither been earned, nor granted. When players work hard to get open, and move without the ball they receive shot opportunities in favorable on-court situations. This benefits each player because they get more easy shots, and consequently benefits the collective. This is the way marketing is supposed to work, at least in a market-driven economy. Attention should accrue to hard-working, smart companies with disproportionately good products and services, and winners should be dictated by customers voting with their clicks and dollars. Marketing should be a meritocracy, like the high speed, motion offense D’Antoni employs. But often, it’s not. Sometimes it’s the gamification of attention. And sometimes it’s the new trend of big technology companies buying out social media software businesses and forcing corporate customers to use them as part of “the stack” – a theoretically holistic solution that rarely offers best-of-breed options across-the-board. Every time marketing strays from a meritocracy, certain companies win, and customers and consumers lose. 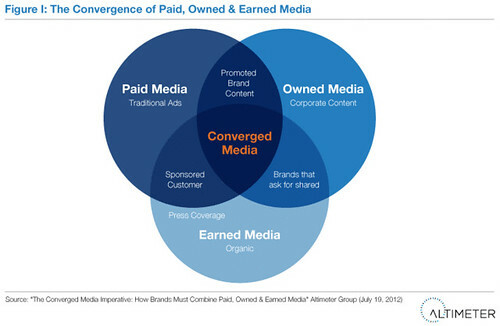 This is the scary outgrowth of the rise of Converged Media, where attention that’s earned and attention that’s purchased is combined in seamless, unprecedented ways. Altimeter Group analysts Jeremiah Owyang and Rebecca Lieb wrote an excellent study on this phenomenon a few months back, and we talked to them at length about it on the Social Pros podcast. One of the most common examples of Converged Media is the Facebook promoted posts feature (see my rant about it here) that enables/requires companies to pay to reach a larger share of their Facebook fans. This is buying attention frosting to apply to your organically created attention cupcake. In fact, you can even promote your own personal posts on Facebook now, so if I want to be sure that all 100,000+ subscribers to my Facebook feed know what wine I’m drinking, I can pay for the privilege of doing so. Converged Media may create exciting new opportunities for companies, but by combining objective reality and purchased reality it muddies the water of attention. Wasn’t the whole point of social media that the power was shifting back toward the consumers, who could shape perception through product reviews, and recommendations and chatter? Two years ago, respected marketers were saying that “brands are simply a collection of what people think and say about them.” If that’s true, then where does AAAAAAa Bail Bonds and social media gamification fit into that scenario? Maybe brands are simply a collection of what people think and say about them, unless you’re behind on your quarterly goals or the CEO can’t handle competitors having more followers on Twitter, in which case it’s gamification and converged media to the rescue. Everyone reading this will be faced with these decisions. You’re probably already faced with them. My appeal to you is to try to resist the easy “win” offered by these shortcuts, and always keep the customer in mind. If the tactic you’re thinking about employing truly benefits the end consumer, by all means give it a try. If instead it truly benefits your company at the expense of the consumer and marketing meritocracy, maybe there’s a better way?